Corruptions that can turn your character into a monster, from a blood-drinking vampire to a savage werewolf. Character options to help heroes face the forces of darkness, including horror-themed archetypes, feats, spells, and more. Rules for sanity and madness, giving all the tools needed to drive characters to the brink and beyond. Tips and tools for running a scary game, along with expanded rules for curses, diseases, haunts, and fleshwarping to bring your nightmares to life. New templates to turn your monsters into truly terrifying foes, from creatures made from living wax to the stalker that cannot be stopped. Characters can take far more than a few hit points of damage when their very sanity is called into question from witnessing horrors too terrible to comprehend. To face such nightmares, the heroes can take new feats, utilize powerful spells, and even acquire holy relics to aid them. They will need every edge they can get if they plan to survive the secrets of this book. 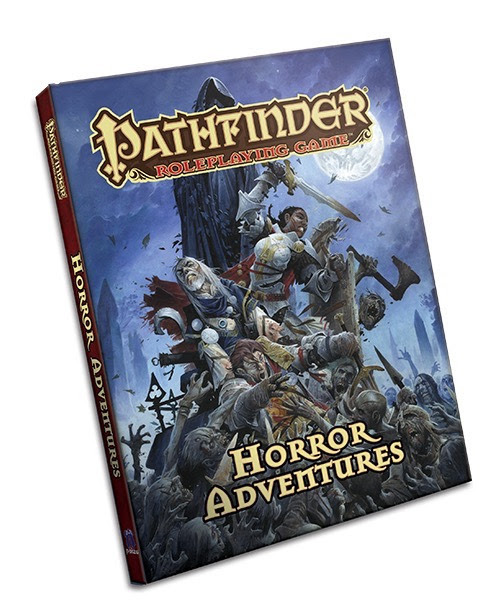 Paizo Inc. is publisher of the award-winning Pathfinder Roleplaying Game, Pathfinder Adventure Card Game, Pathfinder Tales novels, as well as board games and gaming accessories. The Pathfinder world, in which players take on the role of brave adventurers fighting to survive in a world beset by magic and evil, is currently translated into seven languages, and has been licensed for comic book series, graphic novels, toys, and apparel, and is being developed into an MMORPG. Paizo.com is also a leading online hobby retail store, offering tens of thousands of products from a variety of publishers to customers all over the world.